World Ocean Day fell on the 8th of June this year and the health of the oceans has never been more in question. The journal Science (I know, straightforward name) reported that 8 million metric tons of plastic end up in our oceans every year. It’s a startling number, and a very frightening one considering how vital the health of the world’s oceans is for all life. However, if you’re out there collecting plastic off our beaches and out of our oceans, what can you do except throw it straight back into the bin? 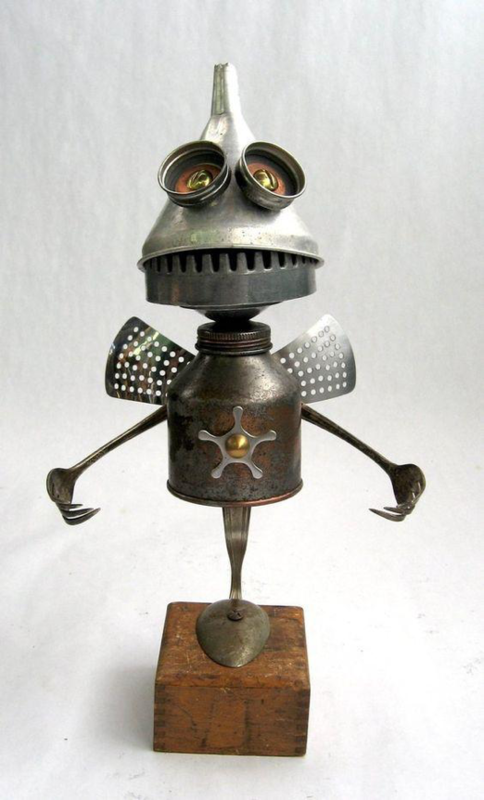 Well, artists of all skill levels have found incredible ways to turn the scourge of ocean junk into recycled art. 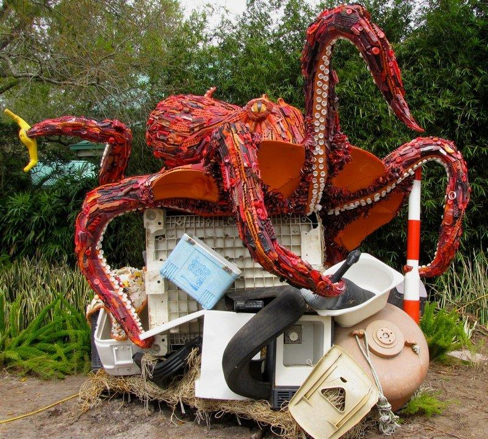 These recycled art projects not only present an opportunity to turn a marine life killer into a positive symbol for a better world, but will also give your house, office, cafe or backyard an impressive and exciting look and save you money. At Future Recycling, we put a lot of thought into waste recycling, so we thought we’d give you a few ideas. And maybe a couple of projects for your next long weekend. Angela Hasseltine Pozzi launched the organisation, ‘Washed Ashore’ as an opportunity to educate a global audience with powerful art that illustrates how destructive plastic debris and ocean pollution is on marine life. It is a powerful reflection on the fragility of the ocean’s ecosystem and the impact our waste habits can have on our most important natural resource. Tess Felix uses plastic debris, found on beaches on the west coast of the United States of America. 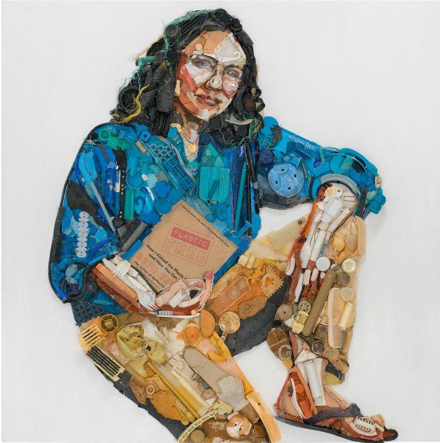 She uses this debris to recreate classic portraits of activists and agents of change in the field of sustainability. This portrait features author Bethe Terry, who wrote the book, ‘My plastic free life’. Talk about art within art. Felix’s work can be viewed on her website. 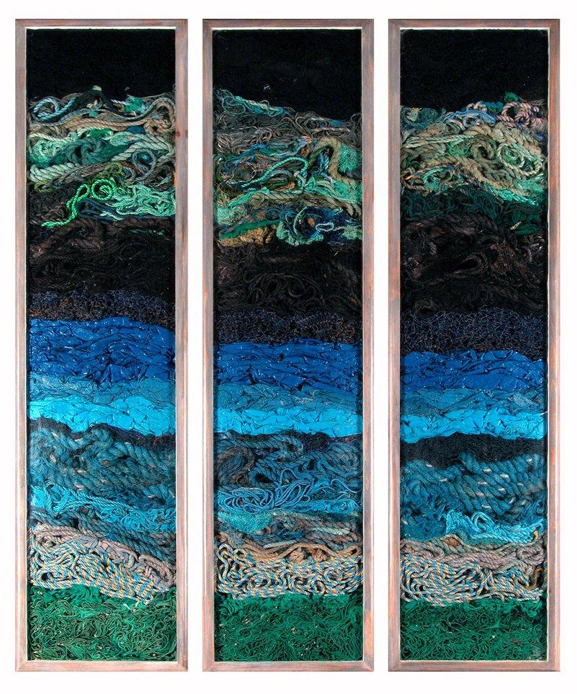 John Dahlsen is an Australian artist who uses the rubbish he collects on the beach as the palette for his art. He writes, “it literally amazes me to think how many times I have bent over to pick up the many thousands of pieces of plastic debris that made up that aspect of my art, each piece jostled around for who knows how long by sand, sun and ocean, their form faded and rounded by the elements.” Check out more of his work here. This isn’t so much an artist’s work as an incredible addition to Victoria’s cafe scene. 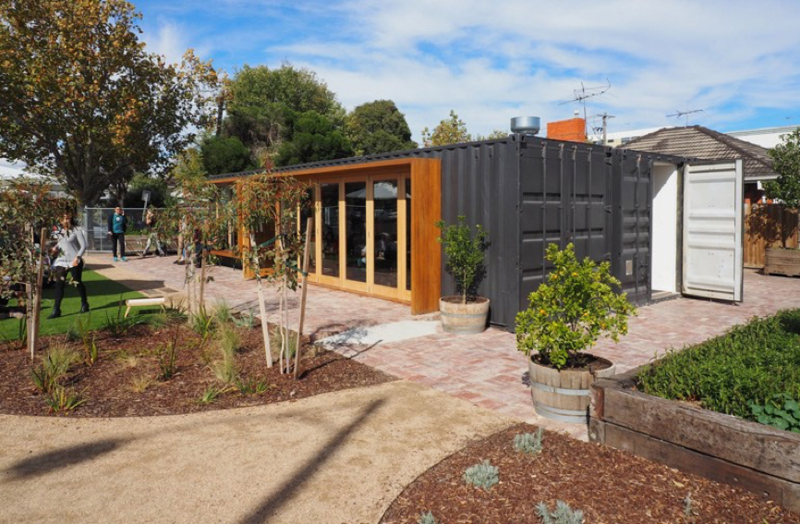 Based in Footscray and made of shipping containers with a large outdoor area, sprawling herb garden and 20,000-litre water tank, Rudimentary is as much about showcasing sustainable living as it is about the culinary experience for customers. I suppose if we are sticking to the theme, what would the world be without the art of coffee? A bit of an opportunity for a kids’ working bee would be to pick out some old junkets, line them up and give the kids an objective. You might get them to fill out an entire day of their school holidays with metal or plastic items that looked ready for landfill. Instead, you’ve got a great interactive activity for the kids (and even yourself, if you feel like joining in the fun.) Here’s an excellent structure built by an Australian local recently. 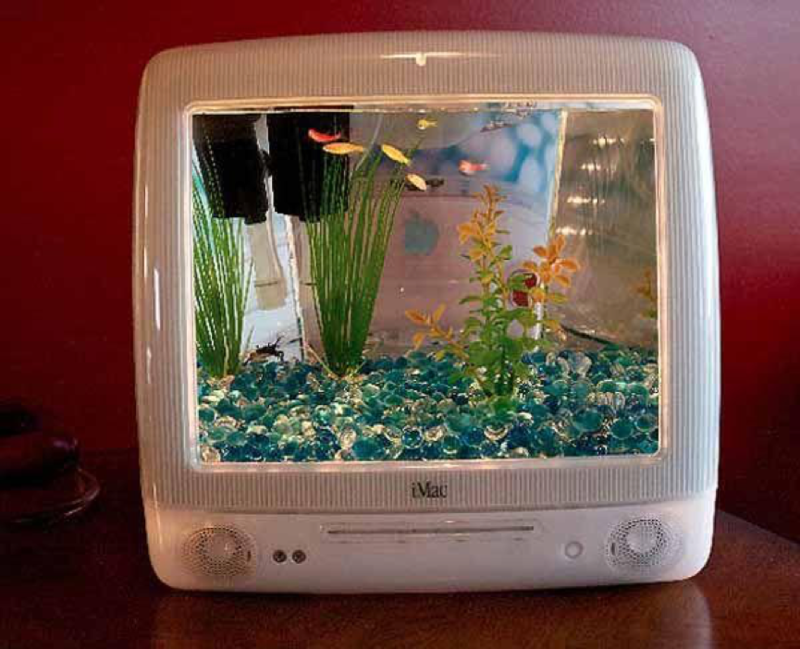 As you can see, this is made completely out of formerly loved household items. If you’re not looking to be the next Re-Casso (Picasso’s cousin from a beachside town in Western Australia), then there are still many other methods to give useless space hoggers in the back shed a second life. Here are seven recycling ideas for household items. 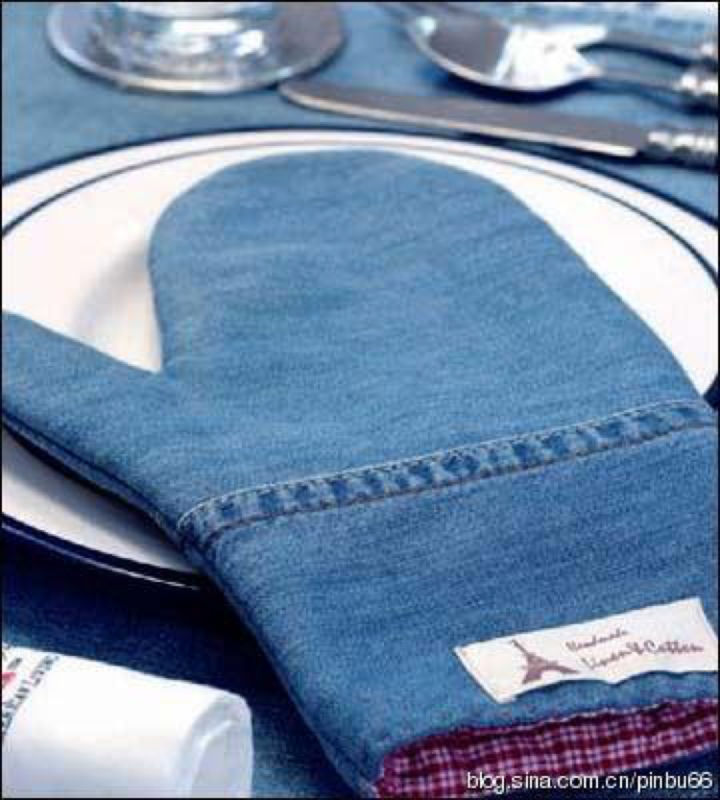 Just one example of the many incredible functions household goods lying round the house can have. 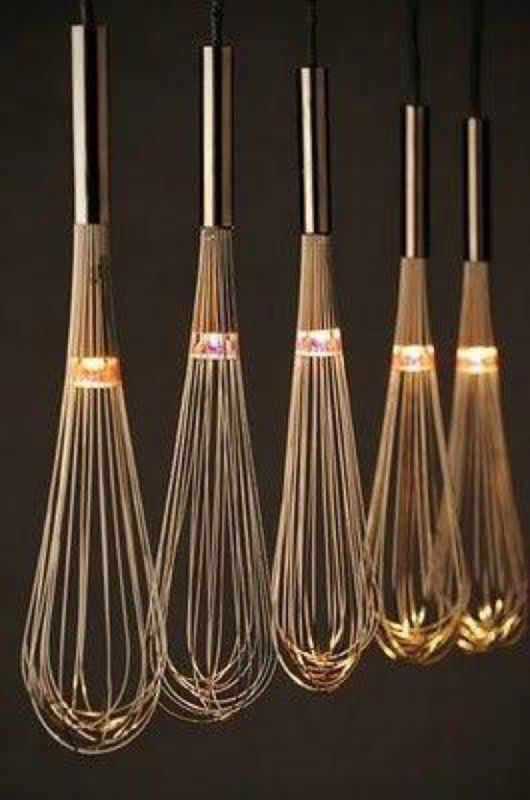 Old whiskers turned into the framework for a fabulous, unique lighting design. The possibilities for old kitchen utensils is endless when you start to break down the elements. Think about egg beaters, crockery, cutlery, bottles and old tea sets. 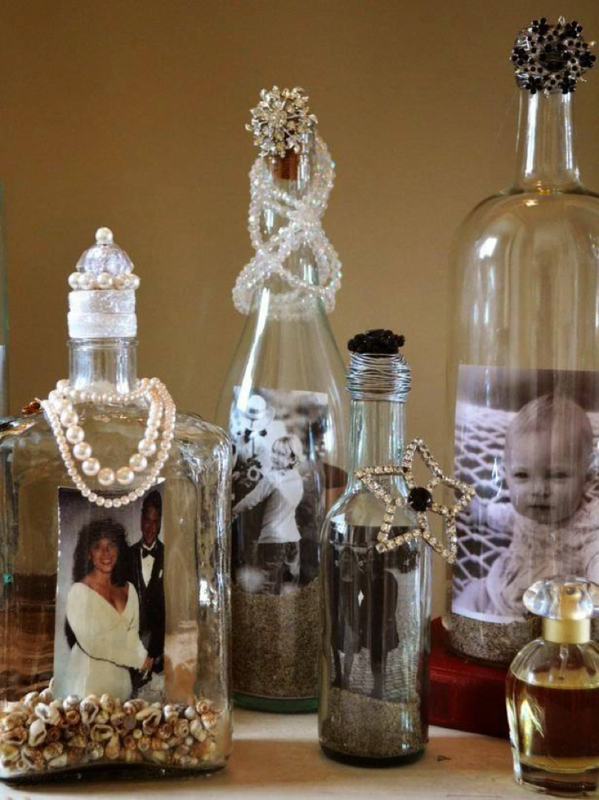 Repurposing them is a magnificent way to breathe new life into a bunch of heirlooms. Tyre fires are out. 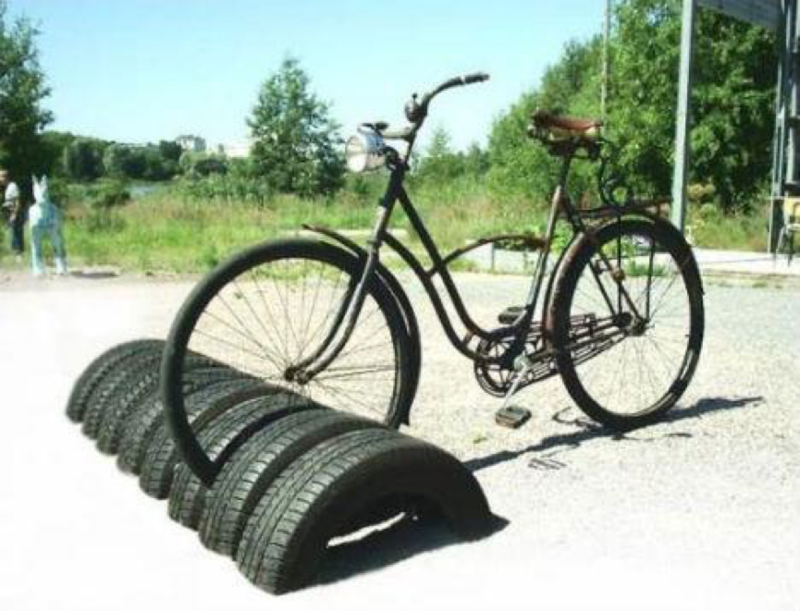 These tyres have now been turned into the hipster’s dream. A sustainable bike stand for your fixie. Other ideas for your tyres are rain catchment systems, doormats, tables and even the base for a raised dog bed for your beautiful pooch. Have you ever wondered about how plastic can give back to a place it has taken so much from? Well, judging on the smile on this young body boarder’s face, plastic bottles can make a pretty decent mechanism for catching a wave or two on the coast. In fact, there are many examples of surfboards being made out of recycled foam or plastic. The surfing community has taken on a huge role in sustainable living, considering that their favourite hobby takes place in the natural phenomenon of the ocean’s tidal system. The ECOBOARD project is one example of how surfing reuses and recycles materials to ensure resources are not wasted. 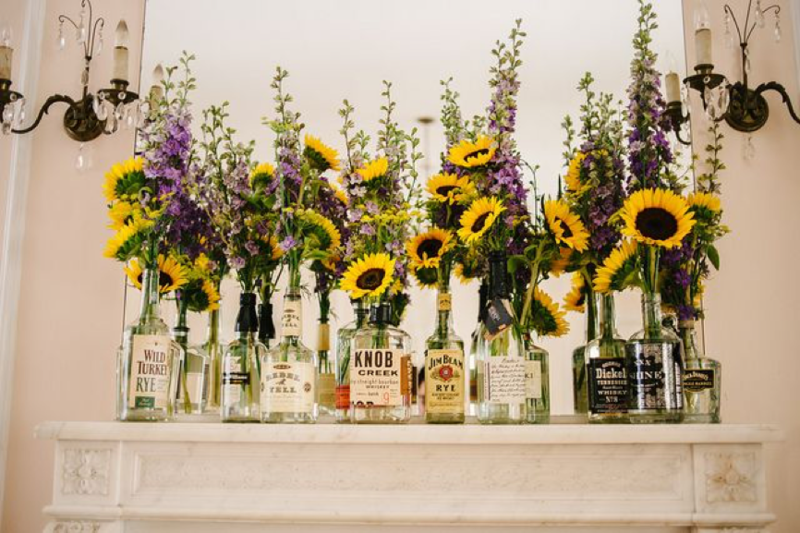 This could be a bit of an idea for your house when the whisky runs dry. Liquor bottles can be sterilised and reused for so many things. Melbourne cafes have been known to use longnecks, spirit bottles and regular stubbies as water bottles and funky juice containers, so maybe it is worth bringing a bit of funk back to the kitchen for long term use. 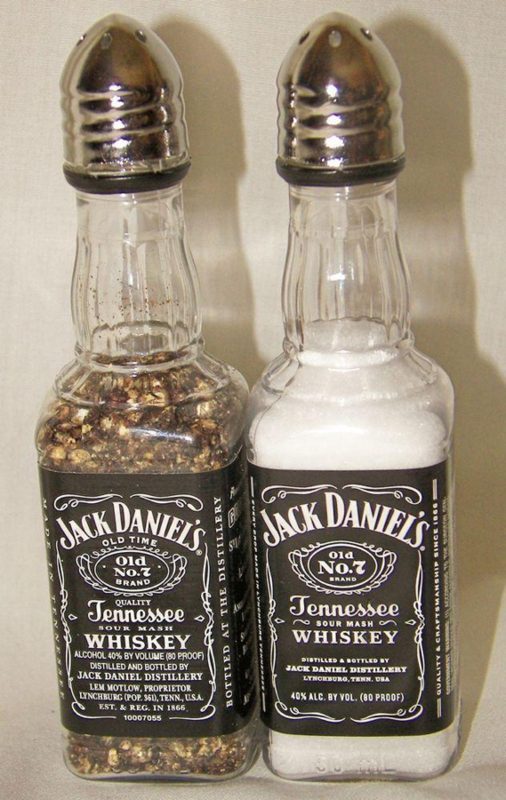 Turn your bottles into salt and pepper shakers, unique photo frames, vases, planter kits, candle sticks and soap dispensers that will draw the eye and last for decades. As seen in the two photos above, old clothes don’t just have to end up in last year’s wardrobe. Both feature new ways to use a couple of unwanted Christmas presents. Although it might take a bit to make, the carpet made up of old t-shirts would make for an excellent talking point. 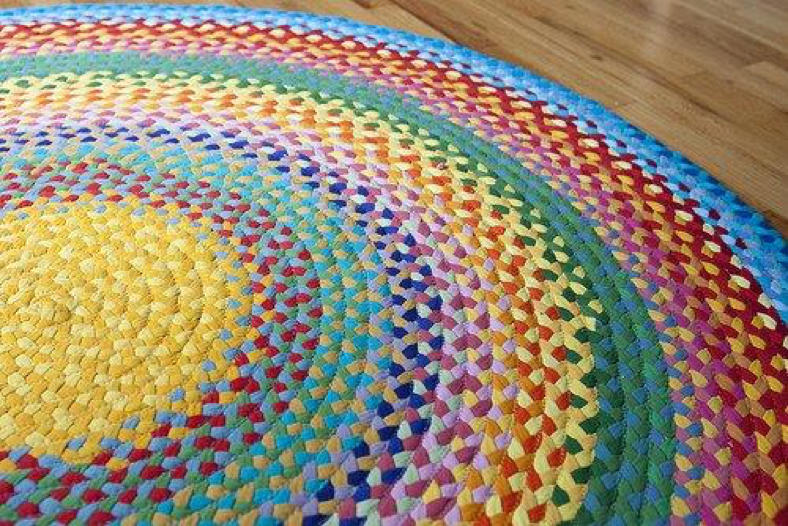 It’s a little bit of a change from the classic Persian rug. And possibly keep them out of view of the person who gave you the gift in the first place… could get a little awkward. 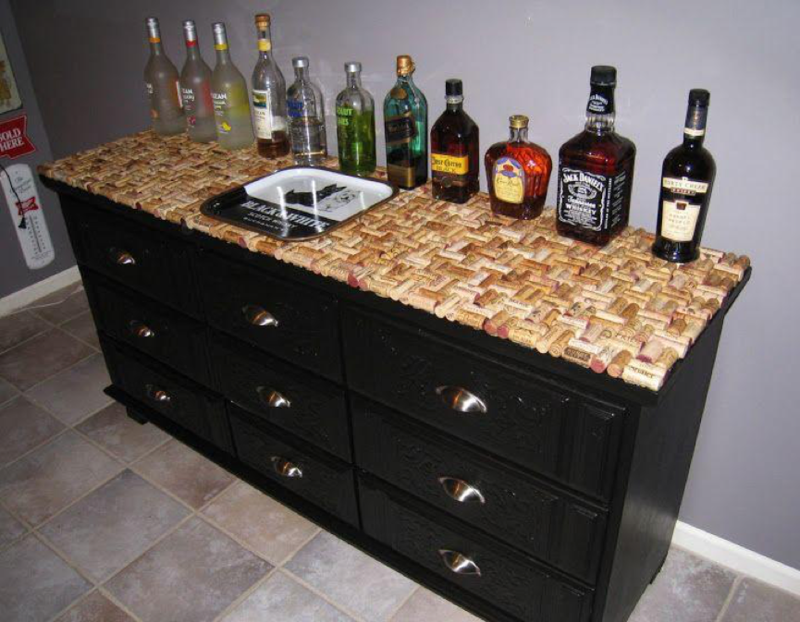 A bar made of corks. What a splendid way to enjoy a drink. This represents one of the most interesting things about recycling old household goods. We know things go out of trend, particularly in a period of the world where digital technology is out as soon as it comes in. The question begs, what happens to your old iMac when you toss it to the curb. Hopefully not into the ocean, river or lake. In this case, we’ve seen hard rubbish turn into a replica of the mystery of the bottom of an ocean, with a school of fish swimming in a computer box fit for a king (Charles Whiting). Whatever we think of rubbish, be it a nuisance, chore or environmental hazard, it’s obvious we need to change our way of thinking. This is just the tip of the iceberg in regard to the endless projects and ideas there are for items we thought had reached the end of their tether. At Future Recycling, we are trying to be better as a business and take a positive step to address world environmental issues by creating an opportunity for us to return unwanted materials and appliances back to the production line. It’s our way of being part of the circular economy. This blog might just inspire you to become part of it too.